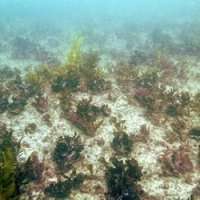 Research published today into the state of kelp forests around the world shows they are being degraded into flat seascapes carpeted by short, unwanted turf-algae – and the Western Australian coastline is one of the worst-affected areas. It is the first time scientists have assessed the global extent of the transformation. The research, carried out by UWA Oceans Institute Associate Professor Thomas Wernberg and Dr. Karen Filbee-Dexter from the Norwegian Institute for Water Research is published in the leading journal BioScience. Professor Wernberg said that over the past two decades many kelp forests had collapsed and been replaced by rapidly growing mats of sediment packed turf algae. "The underlying drivers vary from place to place but humans are the root cause. This is all comes back to how people affect the global and local environment," Professor Wernberg said. "Most worryingly, these critical transitions can be very difficult to halt or reverse because climate change is pushing more and more kelp forests over the tipping point for collapse." Dr. Filbee-Dexter said some of the worst affected areas included Western Australia, southern Norway and Atlantic Canada. "Climate-driven marine heat waves, strong storms, expanding tropical herbivores, gradual warming temperatures, invasive species and nutrient pollution are some of drivers shifting kelp forests into degraded turf reefs," Dr. Filbee-Dexter said. "The problem is, kelps thrive in cool water and ocean warming is stressing them, lowering their capacity to resist the many pressures they are facing." Professor Wernberg said the socio-economic as well as ecological consequences of this global deforestation could be devastating. "Kelp forests support ecosystem services such as biodiversity and fisheries resources worth up to almost $1 million per kilometre of coastline per year," he said. "Our research is now changing from documenting kelp loss to discovering solutions to curbing the rise of turf and the flattening of our global kelp forests. "These active solutions are the only way forward if we want to maintain these unique and valuable ecosystems."